While we noted earlier today that preparations are moving full speed ahead for a debut of the white iPhone 4 within the next day or two and shipments making their way to retail stores, some retailers have jumped the gun and begun selling units to customers. Once such case popped up late last week in the UK through Vodafone, although the carrier apparently quickly clamped down on the rogue sale. But with more shipments now on location at retail stores, the premature sales are likely to occur with greater frequency. One MacRumors reader wrote in today to say that he had just purchased a white iPhone 4 through a Mobistar retail shop in Antwerp, Belgium. According to the reader, the white iPhones are already available for general sale to all customers. 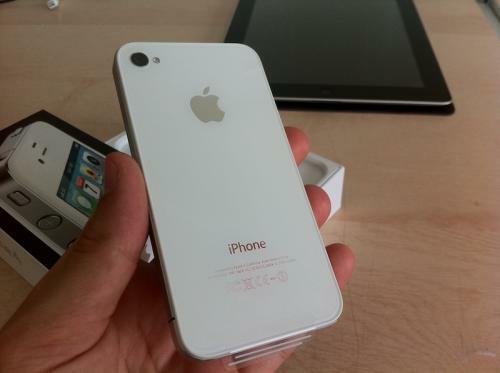 As in other recent photos, the final version of the white iPhone 4 carries a redesigned proximity sensor area on the front panel, utilizing a relatively large, lozenge-shaped area above the earpiece as opposed to the grille of small holes seen in early designs. 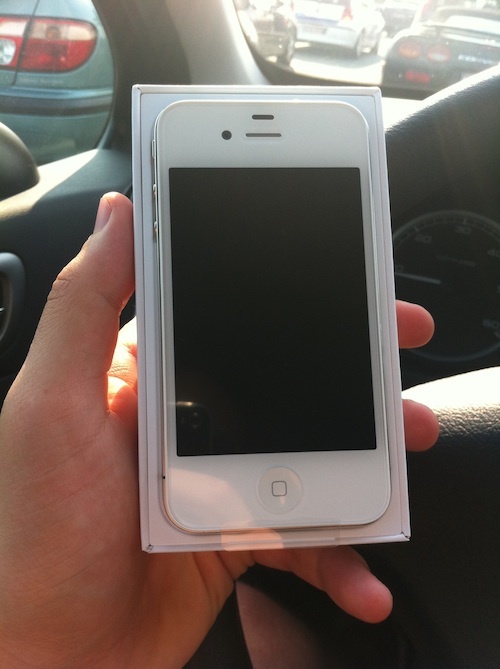 Update: iSpazio reports that yet another white iPhone 4 has been sold to a customer in Italy. 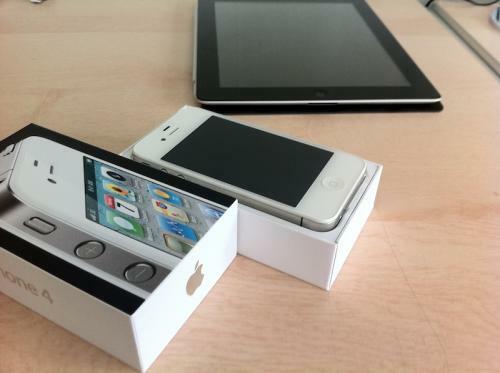 Update 2: The customer in Belgium has sent us another photo showing the "About" screen of the new white iPhone 4, revealing that the units are shipping with iOS 4.3.1 Build 8G4, the same build of iOS 4.3.1 released to GSM iPhone 4 users in late March. Apple has, however, since released iOS 4.3.2 for existing devices. People from Belgium have 4 fingers. confirmed. So what? What's the big deal? Aren't these phones like a year late? JUST START SELLING THE DAMNED THINGS ALREADY! Hard to believe it's actually real. But man, it does look great. He couldn't wait to get home to take the picture? Seriously. Put the stuff down and drive. He deserves a ticket. Pretty sure he's in a parking lot and parked, buddy. can we just copy all the comments from the previous white iphone thread from earlier today over to this one ... don't think anyone has something new to say about it since not much time passed. - or maybe a summary of the comments? The over/under on MR white iPhone stories this week is now 8. Well if I get one for the wife, I am sure I will get laid plenty!! Now the new debate. Will a black iPhone 4 or a white iPhone 4 get you laid more? I think he may be right. I've never seen a parking lot with rows of cars parallel parked. Haha I was driving indeed!